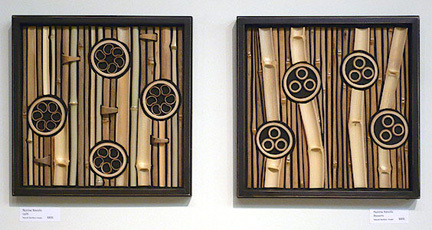 NOVEMBER – DECEMBER 2011: Works in Wood is one of the hallmark juried shows at New Hope Arts in New Hope, PA. I’m happy to be among this year’s exhibitors. See blog for more info on this. 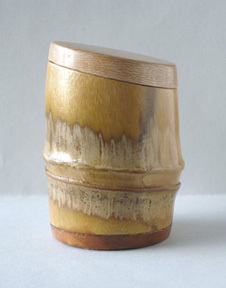 OCTOBER 2011: “Small Treasures” on Crafthaus online. JUNE 2011: The 18-artist co-op that I’m a member of is participating in this year’s “Hidden Gardens of Lambertville Tour” which is happening on the 11th. I’m showing garden-themed paintings this month at the gallery, because 15% of the sales go to the Kalmia Club, whose volunteers are dedicated to education, leadership training, and community programs. 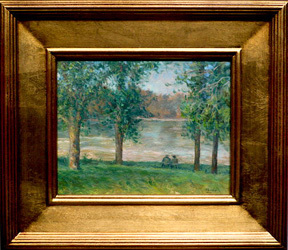 MAY 2011: My first 2-person exhibition with the Artists’ Gallery is “Meditations on Nature” with landscape painter Michael Schweigart. Natural elements abound in this show, with Michael’s beautifully rendered landscapes, riverscapes, barns, and my beach stones with glass spheres, wood mosaics, silverpoint drawings of animal skulls, and my latest bamboo mosaics. Show continues through June 5. 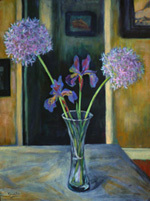 Artists’ Gallery, 18 Bridge Street, Lambertville, NJ. Hours are Friday, Saturday, and Sunday from 11-6 or by private appointment. Clink here for more info. 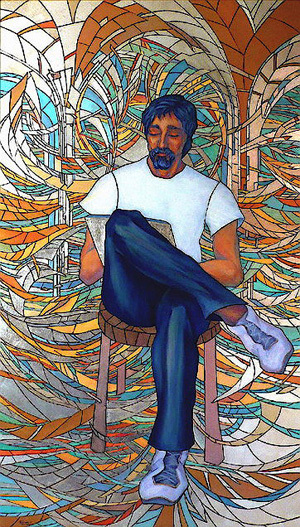 DECEMBER 2010: There’s no shortage of art openings this month! Earthly Pleasures is the current online show at Crafthaus where I have three mosaics, all wall-mounted pieces. 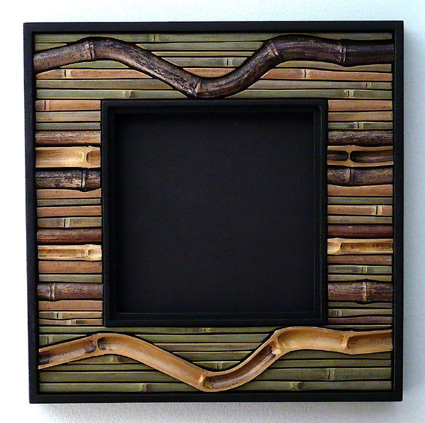 “Bamboo” is a mirror frame consisting of bamboo; each tile is cut and the edges are slightly beveled. 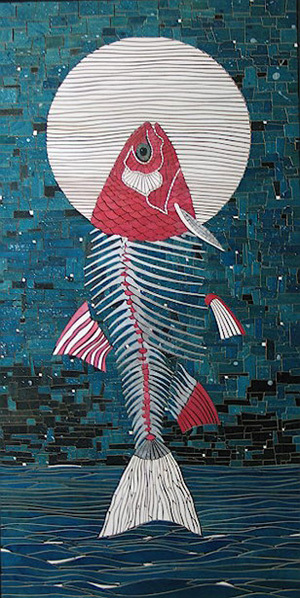 “Pisces Rising” and “Genesis” are wood mosaics that are made from the scraps that woodworkers discard every day. I’ve gotten quite an assortment of woods from these folks. “Works in Wood 2010” “Works in Wood 2010” at New Hope Arts is coming up! This is a very popular national juried show that is held annually at the arts center, corner of Bridge Street and Stockton Ave. in New Hope, PA. The show opens on November 13, with the Artist Reception on November 20th. Show runs until January 2, 2011. I love this show! Come and see why it’s one of the most highly anticipated shows in the region! I have two wall-mounted pieces in this show, both mirror frames. NOVEMBER 7, 2010: Sunday , was the opening reception of “Holiday Small Works” at Canal Frame-Crafts Gallery in Washington Crossing, PA. It was a perfect Fall day as gallery artists greeted guests inside and outside in this great setting across from the historic park along the Delaware. This year marks their 20th anniversary! I have two landscape paintings in this show, which runs until December 31. “Afternoon in the Park” is an 8″ x 10″ oil painting. 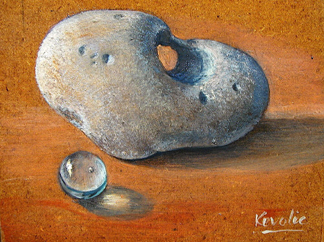 (I’m happy to report that this painting was published in the current edition of Nouveau magazine, November 2010 issue.) Please contact the gallery for purchase. NOVEMBER – DECEMBER 2010: Look for my landscape paintings in the “November Holiday Show” at the Chapman Gallery in Doylestown, PA. Show runs until November 30th. Each of these paintings is mounted in a beautiful plein air frame. To purchase, please contact the Chapman Gallery.